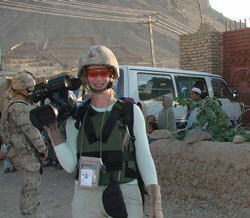 Alison MacLean, a Vancouver photojournalist has just returned from her fourth trip to Afghanistan where she is helping the Rotary Club of Vancouver Sunrise complete a project to assist the brave, young police women there by providing protective garments. She says she shot some great video footage for upcoming film projects and was able to distribute some protective gloves to women police cadets. The made-in-Canada gloves, purchased with part of the $8,000 raised by the Rotary Club of Vancouver Sunrise, the Rotary Club of Torrey Pines, California and many other Rotarians and friends, were a hit. She will purchase many more, along with other protective items, to distribute on her next trip in late November. As we all know, the Middle East exploded with violent demonstrations shortly after Alison arrived in Kabul early September. This violence virtually shut down the city, confining Alison to a deserted compound for three days and forcing her rescue which culminated in a military transport flight to Kandahar. After that experience, Alison moved about the country in armoured vehicles and helicopters, always with the protection of US Marines or security forces from Belgium, France and other NATO countries. She found it reassuring to be traveling with "good-looking guys with guns" but, even so, it involved real risks for her safety. In addition to rocket attacks, there were incidents of children killing children (a 14-year-old suicide bomber killed himself and five other kids), a girl was shot and killed because she was the outstanding student at her school, and a police woman was killed by male police because she was doing an outstanding job, overshadowing them. Sad situation. On the other hand, Alison observed a number of good things happening, too. There are now 300,000 children attending school, a huge increase from 2 years ago. There are about 1,000 women police, many of them performing administrative duties, but some on regular police work with a particular focus on the safety of women and children. Health care has been improved considerably. Alison visited a midwife training program which will increase mother and baby health in a poor rural community. New roads have been built and other infrastructure projects are underway. Alison has high praise for the vital security work being done by ISAF soldiers (the NATO security force). We're pleased that Alison has returned safely and that Rotary’s contribution to the safety of the brave women police cadets will be useful. On her November return trip to Afghanistan, Alison hopes to complete filming for her documentary "Burkas to Bullets" which focuses on the training program of the women police cadets. This documentary will be seen in many countries in March 2013 in association with International Women’s Day and will focus on “the other side of the story, the legacy that will be left when the troops withdraw in 2014”. The Rotary Club of Vancouver Sunrise, Vancouver, Canada and the Rotary Club of Torrey Pines, California, USA are pleased to join with other Rotarians and friends as the major sponsors of this project to help protect the brave women of Afghanistan who are putting themselves in harms way by volunteering as police women. Click here to read Alison’s story from the front. The Torrey Pines (La Jolla) Rotary Club has been very active with Matching Grant projects with the Rotary Foundation. In 2006-07, the club is involved with 7 projects in India and various parts of Africa: a $23,900 project in India for a Rotary Dialysis Center (D-548), a $12,500 project in India for a Rotary Trauma Center (D-705), a $18,500 project in Tunisia to provide a vehicle to an orphanage (D-696), a $45,000 project in Kenya to provide hand pumps to existing wells (D-595), a $44,550 project in Uganda to support 3 schools (D-715), a $54,000 project in Niger to fight hunger (D-608), and a $50,000 project in India to provide a Diabetic Retinopathy machine (D-770). In 2005-06, our main International Service projects are 2 Matching Grants in India for a total budget of $45,500. The first project (D-269) will provide funding for Polio Surgery Camps at around $80 per patient. The second project (D-268) will purchase an X-Ray machine. In 2004-05, the club did a $50,000 project to provide some equipment for handicapped patients of a Tijuana Hospital. See the details of the project (D-240) on the Matching Grant website. In 2003-04, the club joined with the San Diego Rotary Club to do a $20,000 project to protect natural water springs in Uganda, with the Rotary Club of Jinja, District 9200. See the details of the project (D-181) on the Matching Grant website. In 2002-03, the Club joined with the San Luis Rey, Poway, and Valley Center Rotary Clubs to do a $23,500 Water Well project in Kenya with the Rotary Club of Mombasa, District 9200. See the details of the project (D-168) on the Matching Grant website. 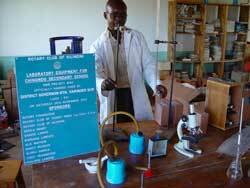 In 2001-02, the Club did a $5,800 Matching Grant project to provide laboratory equipment to a secondary school south of Mombasa, Kenya. See picture above (click on the picture to see a bigger one). See the details of the project (D-103) on the Matching Grant website. In the previous years, the Club had done two other projects in India, financed some woodworking equipment in France for a drug rehabilitation center, and helped to coordinate the donation of French books to Madagascar. Our first Matching Grant project was in 1995, when the Club had financed a $10,000 village bank in Masaya, Nicaragua. In 2001 club member Philippe Lamoise joined the 2000-01 District 5340 GSE Team to East Africa, District 9200 (Ethiopia, Kenya, Tanzania, Uganda). The Team Leader was Bob James from the La Mesa Sunrise Club. Philippe joined the team to document the trip with digital photography and video. This GSE team resulted in many Matching Grant projects between District 9200 and 5340, one of the team member joined Rotary (Tim Kelley joined the Rotary Club of Brawley), and two team members served as Rotary Volunteers (Julia Stevenson, and Philippe Lamoise). Another member of the Torrey Pines (La Jolla) Rotary went on a GSE trip in April 2000. Bill Irwin was the Team Leader for the 1999-2000 District 5340 GSE Team to District 4240 (Belize, Guatemala, Honduras). Philippe Lamoise served as a Rotary Volunteer to District 3070, Northern India, in February 2003 and in November 2004. He teached computers to monks in a Tibetan Monastery, and to members of the community. See the detailled story of his experience on the District 5340 website, with pictures and video. Vanessa Puniak, a Past Ambassadorial Scholar to Senegal in 1984-85, was sponsored by the Torrey Pines (La Jolla) Rotary Club to serve as a Rotary Volunteer to District 9220, Madagascar, in December 2001. She helped an ecological center over there with their radio and energy project. Lamoise and Don Yeckel, have served as scholarship sub-committee chairs for the District. In June 2001 the club financed through Project Mercy the constuction of an individual house in Tijuana for a poor family, and also provided volunteers for the construction. The houses are very basic, but are palaces compared with where the families lived before. Click here to see the pictures. The Torrey Pines (La Jolla) Rotary Club sponsored an Orphanage in Tijuana, through a "Children Opportunity Grant" with the Rotary Foundation, to provide medical treatment at UCSD Medical Center for orphans afflicted with AIDS. Additional supplies, food and clothing were provided to the orphanage throughout the grant program. The Torrey Pines (La Jolla) Rotary Club supported the 2002-03 District Project Wheelchairs for Malawi, by financing 28 wheelchairs through individual club member contributions. Club member Philippe Lamoise also joined the team that delivered the wheelchairs in April 2003, to document the delivery with digital photography and video. See the detailled story of the delivery on the District 5340 website, with pictures and video.